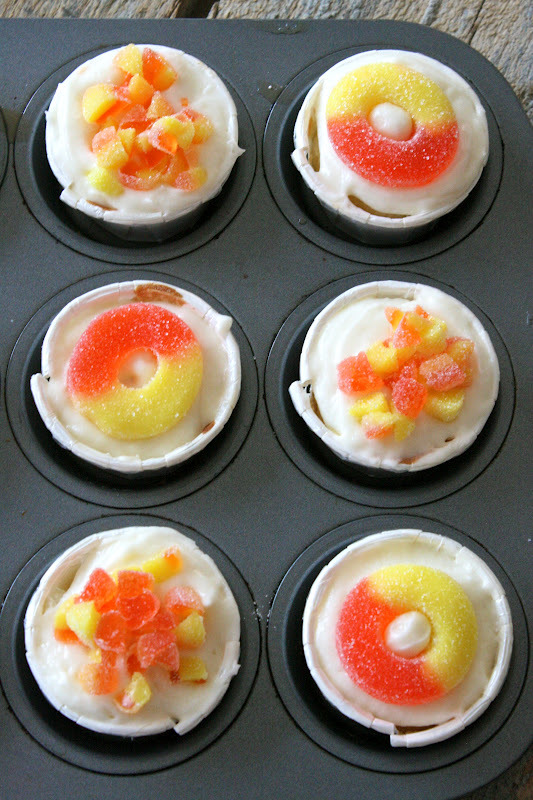 Gummi Peach Ring Flavored Cupcake Recipe / Hey, EEP! Oh, hey! How was your weekend? Loads to share about ours: We took a trip to the New York Aquarium in Coney Island (with an obligatory stop at Nathan's, obviously), hosted a super simple Provencal-style dinner for friends and went to a surprise birthday party at Brooklyn Winery. Zomg, cutest...place...ever! About the party, I was put in charge of bringing a birthday cake to Williamsburg. I stealthily asked the birthday girl what flavor treat she'd like on her special day, "if we have a chance to celebrate together," putting the whole covert celebration at risk because I am a terrible (TERRIBLE!) liar. She replied with a challenge: Make dessert that taste like gummi candy. The original plan was to go all-out with gummi decorations but sticking with the peach ring–theme felt like the responsible thing to do. I trimmed rings into flowers using kitchen scissors, then used the scraps to decorate mini cupcakes. 1. Make the cupcakes: Preheat the oven. Line a 12-cup muffin tin with paperliners. 2. Beat the butter and sugar with a mixer on medium-high speed until fluffy,about 3 minutes. Add the eggs, one at a time, beating well between eachaddition. 3. Whisk the flour, baking powder and salt in a bowl. Add the flour to thebutter mixture in 3 additions, alternating with the milk in 2 additions. 4. Divide the batter among the prepared cups, filling each three- quarters ofthe way. Bake until a toothpick comes out clean, 15 to 20 minutes. Let cool inthe pan 5 minutes, then transfer to a rack to cool completely. 5. Meanwhile, make the gummi syrup: bring the water and gummi peach rings to asimmer in a small saucepan over medium-low heat. Cook, stirring, until thecandy dissolves, about 5 minutes. Continue to simmer until the mixture issyrupy, about 10 minutes. 7. Make the frosting: Beat the butter with a mixer. Add the vanilla,confectioners' sugar and salt and beat until combined. Beat in the heavy creamand reserved peach gummi syrup to reach your desired consistency. Love this idea Erin, so adorable! Would be cute to try this with the mini gummy coke bottles too. Oh fabulous, Mamun! Thank you so much, I truly appreciate it! They're in the oven! Thanks for posting this! Hey Henry, I'm so glad to hear you made 'em! How did they turn out! ?